Tattoo recognition technology uses images of people’s tattoos to identity them, reveal information about them such as their religion or political beliefs, and associate them with people with similar tattoos. While still in its infancy, the technology is being actively developed by private companies with the support of federal agencies, state law enforcement, and universities. Researchers test and train the technology using photographs of inmates or scraped off social media, raising critical issues of ethics, privacy, and our First Amendment rights. Tattoo recognition is a form of biometric technology in the same category as face recognition, fingerprinting, and iris scanning. Tattoo recognition functions in a similar manner as face recognition. Once an image of a tattoo is captured and submitted to the system, image recognition software creates a mathematical representation and analyzes it for specific details and matches those against images already in the database. Humans can also tag these images with metadata to further describe or categorize them. Tattoo recognition often captures multiple images of individual’s tattoos and may also capture people’s faces or their entire bodies. The National Institute on Standards and Technology (NIST) has developed a series of “Best Practices” for capturing images of tattoos for use with tattoo recognition technology, including taking two photographs of each tattoo, one that narrows in on the tattoo itself and another that more clearly shows where tattoos are located on the body. For large tattoos, NIST encourages police to take a full photo of the tattoo in its entirety, followed by photos of particular areas of interest in the tattoo. It is important to note that in detention environments, images of tattoos may be collected from entire body, including areas that would not be publicly visible, such as upper legs, chests, and genital areas. These tattoos are often tagged with metadata about the tattoo, including position on the body and ink color. The recommended tagging system (ANSI/NIST-ITL Standard) has dozens of codes to categorize the imagery of the tattoo, ranging from general categories such as political symbols and sports icons to very specific images such as a dragon or the American flag. Law enforcement may also collect images in the field during routine police stops using regular cameras or mobile biometric devices. At least one application in use in Indiana also attaches GPS location data. In addition, tattoo recognition software may ingest images found online on website or social media. Although law enforcement has long used tattoos to identify suspects and map associations of gangs and hate groups, the automated technology in development would do much more. Before automation, tattoo recognition often involved maintaining binders of tattoo photographs, similar to a mugshot book. In recent years, police departments have begun digitizing these images and adding them to databases, along with tagged metadata. In recent research funded by the FBI, NIST identified several specific uses for tattoo recognition technology by law enforcement. These include identifying a person by their tattoos, as well as identifying a suspect whose tattoos are partially caught on cameras. 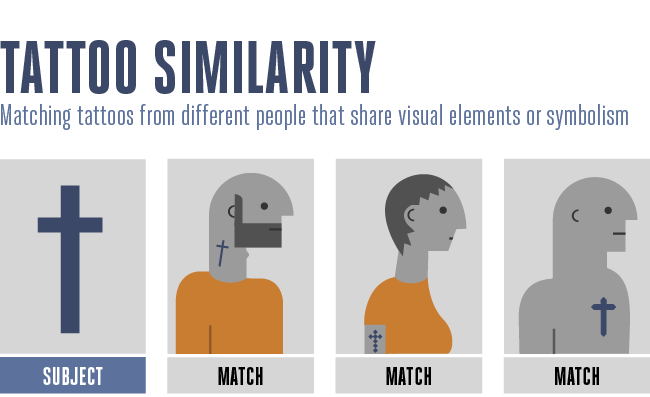 More alarming uses include discerning the meaning of their tattoos by matching it to similar imagery and mapping out connections between people with similar tattoos. Tattoo recognition is still a developing technology. However, we have seen it included as a feature in several biometric identification technology systems, alongside face recognition, fingerprinting, and iris scans. One real-word deployment is “Gang Graffiti Automatic Recognition and Interpretation” (GARI), a project between Purdue University and the Indiana State Police that allowed law enforcement around the country to share photos of graffiti and gang tattoos, along with time stamps and GPS coordinates, through a web app. The recognition software promised to allow law enforcement to map out gang activity and growth in communities. The program was supported by the U.S. Department of Homeland Security, which believes it can be used to international gangs involved in drug and human trafficking. Idemia (formerly known as OT-Morpho or Safran) is one of the largest vendors of biometric identification technology in the United States, including tattoo recognition technology. Other vendors include Face Forensics and DataWorks. Notably, multiple universities are developing this technology for use by law enforcement and private industry. Idemia is working with the University of Michigan, while the Indiana State Police collaborate with Purdue University. Research institutions such as the French Alternative Energies and Atomic Energy Commission, the Fraunhofer Institute of Optronics, System Technologies and Image Exploitation, and the MITRE Corporation all participated in NIST’s tattoo recognition technology project. Tattoos have meaning for the wearers, whether it’s a cross representing their religion, a portrait of their children, or simply the logo for their favorite band. 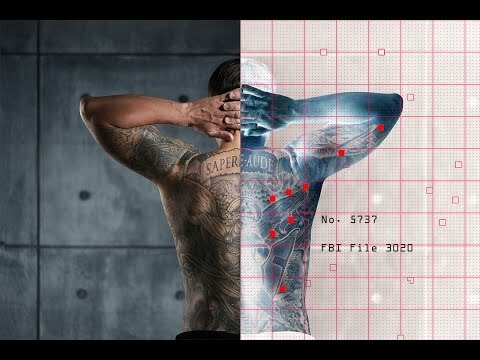 While many of threats posted by face recognition carry over to this and other forms of biometrics, tattoos are unique because they implicate many First Amendment rights and are elective. In fact, in its research, NIST specifically claimed that “Tattoos provide valuable information on an individual’s affiliations or beliefs and can support identity verification of an individual.” By using this technology, a law enforcement official could use tattoos as a proxy to create lists of people based on their religion, nationality, political ideologies, or common interests. However, assumptions made about tattoos can be wrong. For example, a Jewish person who wears a Star of David tattoo could be automatically affiliated with a member of a Chicago street gang whose members also wear six-pointed star tattoos. Alternately, a person who obtained a gang-affiliated tattoo as a teenager may still be categorized as a gang member even if they had not been affiliated with a gang in decades. There is also a threat that tattoos may be used to target immigrants for deportation. An immigrant who received Deferred Action for Childhood Arrivals status was detained and fast-tracked for deportation because immigration officials claimed he had a gang tattoo. The immigrant said the tattoo actually signified his place of birth. News outlets have reported that immigrants are seeking tattoo removal services to avoid being caught up in a deportation dragnet. Tattoo recognition technology may also be used to expose or surveil people on the Internet. German researchers, for example, designed technology that could match photos on an online tattoo website to Germany’s police database. 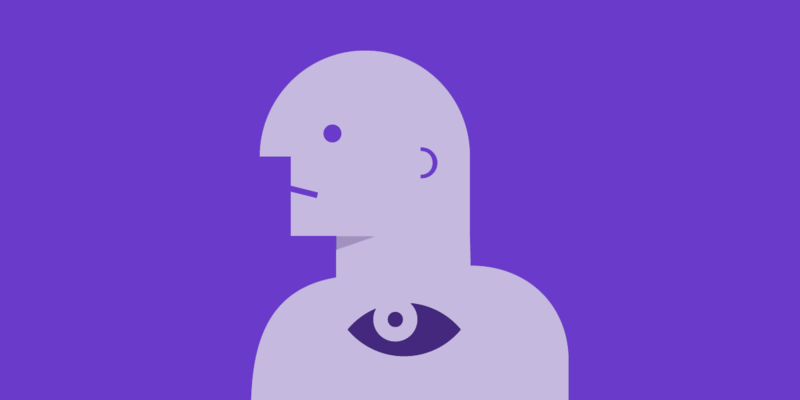 Through a series of Freedom of Information Act (FOIA) and state-level public records act requests, EFF has exposed a variety of tattoo recognition programs. Much of our focus has been in investigating NIST’s Tattoo Recognition Program. Our research revealed that NIST scientists had ignored ethical obligations for conducting experiments with images taken from inmates. They received a waiver of these obligations only after the research had been completed. Through direct advocacy and a grassroots campaign, EFF successfully pressured NIST to overhaul its privacy safeguards and to redact sensitive images from public materials. However, EFF does not believe that NIST has gone far enough. In November 2017, we filed a lawsuit against the U.S. Department of Commerce, the U.S. Department of Justice, and the U.S. Department of Homeland Security to force the release of documents, including the names of the institutions that received images of inmates through NIST’s program. The lawsuit also seeks to uncover to what extent the FBI influenced the research, which may have triggered additional ethical scrutiny.